Fat and juicy overdrive sounds with a hint of fuzz. 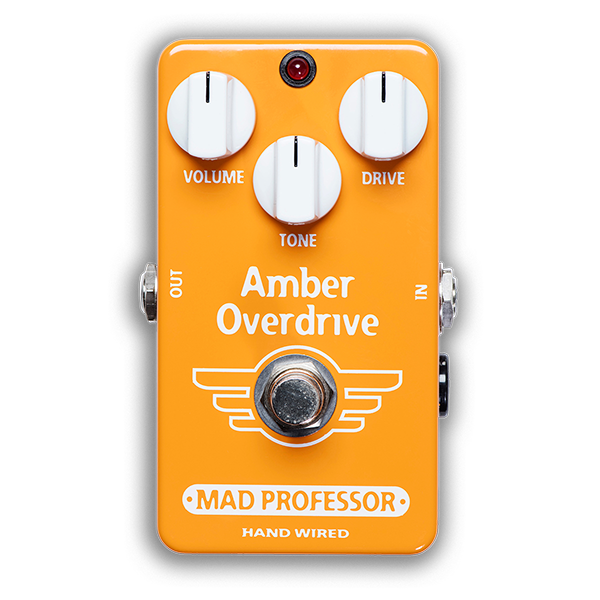 Amber Overdrive is a fat sounding pedal in Mad Professor Hand Wired Custom series. One of the most sought-after guitar tones is a combination of a great overdrive or fuzz pedal into overdriven tube amplifier. Amber Overdrive produces this sound even when running through a clean amplifier. It produces a very thick sound whether playing chords or single notes – fat and juicy with just a hint of fuzz. Though highly saturated, this dynamic overdrive can be cleaned up with the volume control of your guitar. As with all Mad Professor pedals, it offers a wide range of dynamics and expressive touch sensitivity. When you plug it into a clean amplifier, Amber Overdrive can give you the massive sound of a saturated amplifier with classic smooth fuzz running wide open. It can also be used as a slightly distorted boost to increase saturation on slightly overdriven amplifiers. Amber Overdrive is great for getting fat singing tone out of vintage low output single coil pickups. It works really well with Fender Telecaster and Stratocaster guitars and with P-90 pickups. Of cource is shines too with humbuckers. Amber Overdrive is hand made in Finland using only premium components, to give years of trouble free operation with superb musical tone. Build the Mad Professor way: small footprint and big tone. CONTROLS: VOLUME: This knob sets the overall output level of the pedal. DRIVE: Settings from low to the center will allow you to control the saturation with the volume control on the guitar. To use amber as light overdrive set this control at the beginning of the rotation. TONE: This is a boost/cut “shelving” type equalizer that controls the amount of high end, operating somewhere between a bright switch and the treble control on most amplifiers. TONE: Turning this counterclockwise reduces the amount of high end. If you must run a buffered pedal ahead of Amber Overdrive try lowering the treble. ELECTRICAL SPECIFICATIONS: Current draw: 2.5mA at 9V DC Input impedance: 45K Output impedance: 25K Voltage range: 7.5-12Vs POWER REQUIREMENTS: 6F22 9V battery or DC eliminator 2.1 mm plug center negative and positive sleeve.